When figuring out a new gadget, you’re sure to encounter a few speed bumps, and the Flip Video camera is no different. Although the Flip is designed to be easy to use, you may be puzzled by one or two functions at first. Here’s a list of common hiccups with the Flip camera, and it provides the solutions so you don’t have to do any heavy lifting. On: Press and let go of the Power button to turn on your Flip (assuming, of course, that the batteries are fresh or recharged). Off: Press and hold the Power button to turn off your Flip. If your Flip doesn’t turn on or off how it’s supposed to, remove the batteries or rechargeable battery pack (if your Flip model allows you to open the back and access the battery) and then reinsert the battery. Then press the Power button to turn on your Flip. If your Flip is on and won’t respond when you press any buttons or when you press and hold the Power button for a few seconds, press and hold the Power button for 10 seconds to restart your Flip. If pressing and holding the Power button for 10 seconds doesn’t reset your Flip SlideHD or Mino, insert the tip of a straightened paper clip or a pin into the reset hole inside the camera’s tripod mount, and press and hold the reset button for 5 seconds. If pressing the Record button has no effect when you connect your Flip to your TV to watch saved videos on your Flip, disconnect your Flip from the cable connecting your camera to your TV if you want to capture new video. If your Mac goes into sleep mode while your Flip camera is still plugged in, the power supplied to your camera from your Mac’s USB port might suspend. If that happens, you might see a device removal warning message when you wake up your Mac. To deal with this, unplug your Flip from your Mac’s USB port, wait a few seconds, and then plug your Flip back into your Mac’s USB port. Plug your Flip camera into your computer. (Optional) If you have any video or other files saved on your Flip that you want to save to your computer, copy the files to your computer’s hard drive using FlipShare (or your chosen method) before you continue, and then quit FlipShare. Open a new Windows Explorer (Windows) or Finder (Mac) window and double-click your Flip camera’s icon. Then navigate to and open the folder where your Flip saves video files you record. Delete all the files contained in the folder and then empty the Recycle Bin (Windows) or Trash bin (Mac) to permanently delete the files from your Flip camera. 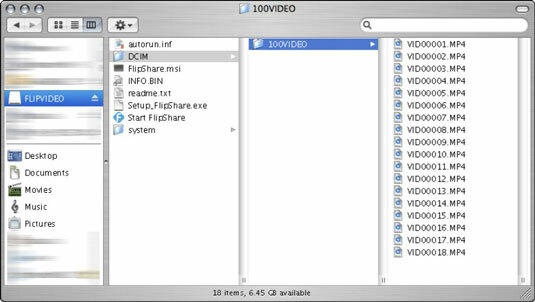 (Optional) If you saved any video files outside the 100VIDEO folder (which is the default), delete those other files, too. Safely eject and then unplug your Flip from your computer. Press and hold the Power button to turn on your Flip, and then check the Time Left amount that appears at the bottom of the screen. If the time displayed is equal or close to the prescribed recording time for your Flip model, you’re ready to start capturing new videos. If the Time Left amount is not equal or nearly equal to the prescribed recording time for your Flip camera model, continue to the next step. Power your camcorder on and off eight times.